Back in March 1, 2010, we discussed 3 Problems with Apple’s iPad. I choose the image on the left because talking about the iPad is literally a hot topic. Whether you support or hate the iPad, if you talk about it, you will easily find that people have a strong opinion about it. Unclear customer value, unreliable data network service of AT&T, and poor brand name cast a shadow of doubt on the performance of the iPad. I received a lot of comments, both positive and negative, regarding this conclusion and the 3 problems that were pointed out. Here is a further discussion of those 3 points based on feedback received from readers at http://idaconcpts.com, followers at @idaconcpts, and online forums. Problem #1: What is the value of having an iPad? From the feedback received, it was very interesting that there was most discussion did not focus on the intrinsic value of the iPad itself but rather on the lack of support for Adobe Flash on the iPad. Apparently there appears to be a consensus that some people might not see the value of owning an iPad. However, calling the inability of Adobe Flash support a problem, bugged several iPad supporters. The above shot taken from Apple’s presentation (hat tip: Engadget) demonstrates quite clearly another big omission from the iPad: support for Adobe Flash. It’s bad enough on the iPhone, but imagine loading up a nice video link on the iPad only to have it… simply not play. We know Apple dislikes its lack of control over the whole Flash ecosystem, and that Flash is the leading cause of crashes on OS X. We can also prognosticate that Apple is hoping that HTML5 will take off quickly and start to disintermediate Flash as the primary technology powering video playback on the web. Still, YouTube just announced their HTML5 player last week. It’s getting out there, but it’s the early days for widespread HTML5 support. It’s doubtful it will be in a position two short months from now to completely replace the Flash experience for web video, leaving a lot of ugly “plug-in missing” boxes to make an appearance on one’s expensive iPad tablet. As of the time that this article was written, there were still developments on this issue. In the same article, Mashable also went to warn potential users of the iPad about other technical difficulties. 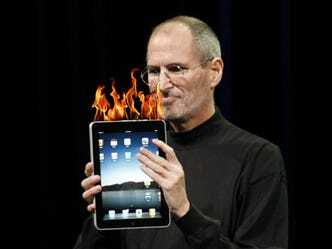 When buying the Apple iPad, you really need to understand all the implications of what the iPad can do and can’t do. Having a real perspective on what the specs of the iPad will allow you to make a better decision on whether or not to buy one. Problem #2: Another monthly bill of AT&T’s 3G network. Supporters of the iPad claim that this is not true. However, isn’t the 3G service from the iPad tied only to AT&T? In the U.S., 3G service will be available from AT&T. Do you really want more of AT&T’s spotty service? Some people pointed out that you can only pay for 3G service only when you need it….yet why would you pay for service that you anticipate to be bad? Some people pointed out that you can get a WiFi only version….yet why would you want another device that can only work at home (don’t you have a laptop, desktop, etc) and that does less efficiently basic features (e.g. try writing a 500 word essay on a laptop or minibook versus the iPad)? Problem #3: Social Media is mocking the iPad. Viral mockery is one of the key elements of Apple’s “I am a Mac” TV ads. Funny that Mac fans love those ads. Funny that when successful viral mockery turns against Apple, the Mac fans revolt! Let’s not take ourselves so seriously! Yes, that’s right I am an Apple fan as well. I still stand by the previous conclusion that unclear customer value, unreliable data network service of AT&T, and poor brand name cast a shadow of doubt on the performance of the iPad. Current pre-order sales of the iPad appear to be healthy and it appears that this pre-order inventory is already sold out. That is not a surprise and should be taken with a grain of salt, this is done on purpose. I would wait until around the holiday season to truly evaluate the performance of the iPad. Thank you to everybody for the feedback! I enjoy healthy discussion. Feel free to leave a comment here or contact me at @idaconcpts on Twitter.